The defendant was sentenced on May 4, 2006, to life in prison without the possibility of release. On May 12, 2006, the defendant filed a notice of appeal. Documents filed in connection with the appeal will be on the U.S. Court of Appeals for the Fourth Circuit’s website. 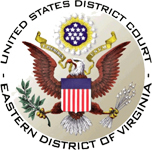 The docket pages of this website will continue to be updated with any post-trial motions or orders in the District Court. On July 31, 2006, the District Court posted copies of all 1,202 exhibits admitted into evidence during the trial, with the exception of seven that are classified or otherwise remain under seal. All other pages of this site appear as they did on May 4, 2006. A list of all pleadings, orders and opinions filed in the case. Click on the document’s docket number to read the full text, except for documents filed under seal.